Double-story homes, mansions and large properties often don't make much sense size-wise or financially, especially if you live in a bustling city. Smaller is the latest in functional and fashionable design. Think about the money saved on purchasing the property as well as the money usually blown on electricity and water for a larger house. Trendy apartments or compact townhouses are not only a huge saving on the pocket but are often positioned much closer to offices, restaurants, entertainment spots and the area's nightlife. There are also several other advantages to a down-scaled living environment, including how much easier it is to maintain and look after. It's smaller to clean, needs less furniture and requires far less energy and time. There is no space for gathering tons of clutter or excess furniture and decorating is much quicker. All that is needed for the perfect, small house is the right furniture and an eye for design. The living room is the heart of a home. This is a space that should never feel cramped, crowded or cluttered. It's the space where afternoon teas are had, where Sunday mornings are spent curled up on the couch with a good book and where comfort is king. Furniture for a small living room should therefore be warm and cushy, but simple and sweet. There is no need to include a lot of furniture in the living room—opt for a few basics. Think quality over quantity. Two or three comfortable chairs, a simple coffee table and some cushions can go a long way in giving the overall effect of a larger living room, without compromising on style or comfort. Utilise the floors and the walls too. Opt for a bold shape when it comes to a rug, giving the impression of a wider, larger floor. Use the walls the create depth with either art or mirrors. Most importantly, have fun taking the time to choose the furniture pieces that work well for the space! The bedroom is the place where a day begins and a day ends, which is why it should be a place that is neat, relaxing and clean. Stick to two colours in the bedroom space, keeping the design simple and bold. A neutral colour teamed with a bright, happy colour can go a long way and maintaining the warmth and allure of a bedroom. Storage is also key when it comes to a small bedroom. Use cupboards, shelves and under-utilised space under and above the bed to keep clothes, books and possessions stored. This is the tidy solution to a cluttered bedroom. Make the most out of the vertical space, where shelves, bunk beds and cupboards can make up for the lack of floor space. Using a square or rectangle rug in the centre of the room will also give the impression of a larger, more spacious bedroom. For more bedroom related ideas check out: How To Make Your Bedroom More Romantic. As an entertainment area the dining room can be a tricky one as it is a space where guests should feel welcome and comfortable, not cramped and on top of each other. The solution: go for smaller furniture. A long, 12-seat dining room table is of no use if no-one can fit around it. Opt for a smaller table that fits into the room comfortably and spaciously. Also make the dining room table the hero of the room, staying away from any other furniture that is going to detract from it. Instead, use the surface of the table to decorate with flowers, candles and any other piece that will add height to the room. Dining rooms should always include some effective lighting options so that guests are never stuck talking to each other under blinding, neon lights. Opt for dimmers in the ceiling if possible, otherwise use long, vertical lamps. This is an area in the home to share with guests and loved ones so include warm tones and create a sense of ambiance. The kitchen is where all of the cooking in a home takes place, where wine is poured and where bread is broken—there is no need to be deterred from it because of its size. 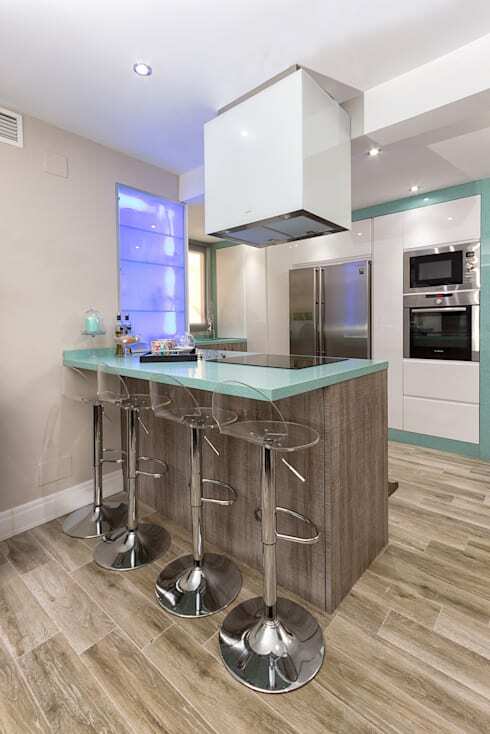 In fact, a smaller kitchen with the right colours and design can add modern style to any home. Use the cupboards of a kitchen wisely, avoiding bottles, cutlery and crockery spilling over onto the surfaces. Jam-packed surfaces give the impression of a lack of space, making the kitchen feel crowded and cluttered. Instead, opt for neat, bare surfaces that look clean and tidy. This is another room where lighting goes a long way. 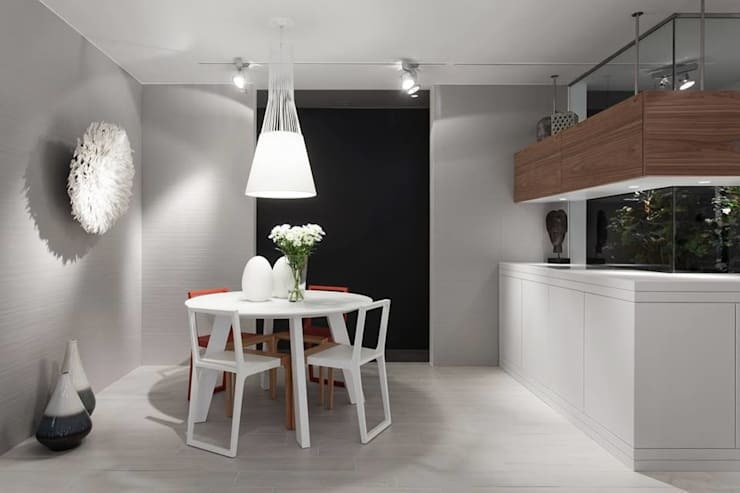 Use a light that drops from the ceiling in the middle of the kitchen, in whatever style is preferred—lantern, lampshade, orbs—to create height in the room. Lights need to be bright in order to see what one is cooking but this doesn't mean that they can't be funky, fun and stylish. If there is an island in the kitchen, put three or four bar stools on the other side of it. This will give the illusion of a longer, slightly larger kitchen and will utilise the space just outside of the kitchen. No matter how small, the kitchen should be a place of glorious smells and delicious creations. Hallways can often be a very tight squeeze, especially in smaller apartments. This is not the place to store bicycles, shoes, coats or hats if space is limited, unless it can be done smartly. Often the walls of hallways are left bare due to space constraints but this in fact makes it look smaller, darker and more crowded. 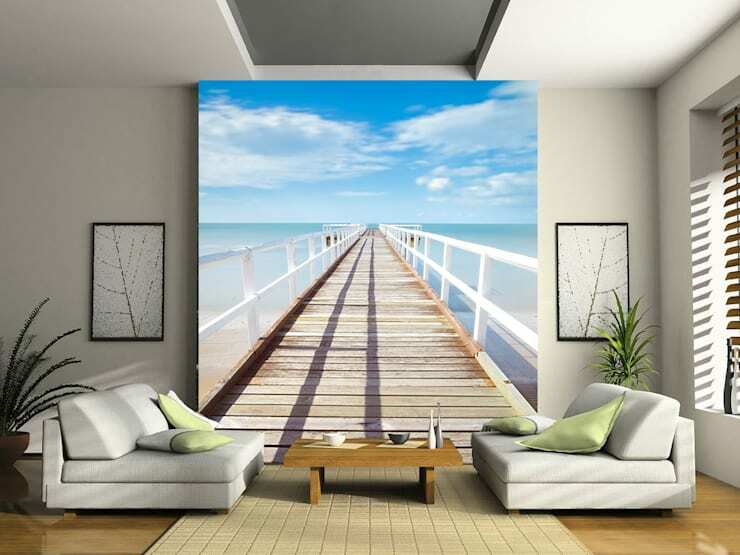 Use a full-length, wide mirror to create depth and light in a hallway or utilise the wall for a wide and long art piece. See what Swedish designer Studio Lisa Bengtsson has done here with Tillsammans Prints. Use a bright rug to brighten a hallway as its often the first part of a house that a person sees when they walk through the front door. It should be inviting and warm. Light is also important in a hallway, both functionally and aesthetically. Functionally, people shouldn't be tripping over their feet as they enter a home and aesthetically, it adds warmth and colour. The bathroom of a small house can be a tight squeeze as builders have often tried to fit a shower, toilet and basin into a very, very small space. This doesn't mean it shouldn't be comfortable and stylish, however. 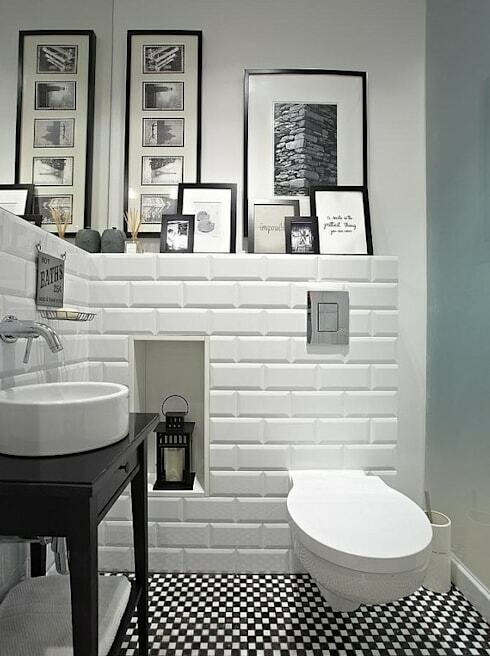 Style a bathroom using every inch of space that you possibly can without taking up more space. Use candles and lanterns to soften the lighting and add little extras such as pampering soaps and creams. Invest in quality, fluffy and soft towels, which will make the bathroom look lavish and warm. A lot of fun can also be had with the walls of a bathroom. See the beautiful designs that Deeco, an online shop in Poland, offers. Whether its wallpaper, mosaic tiles or a lick of paint, the walls of a bathroom can change the whole look and feel. It's the finishing touches in the bathroom that make it a beautiful addition to a home and it shouldn't be a room that is overlooked. Invest in some art, mirrors or picture frames for it. Use bright colours. Make it a space that people don't want to leave. The home office is a space that should be inspiring and creative, which can sometimes be tricky in a small apartment or house as often it is thought that a whole separate bedroom is needed. However, by making the most of every nook and cranny, a home office can take shape just about anywhere. 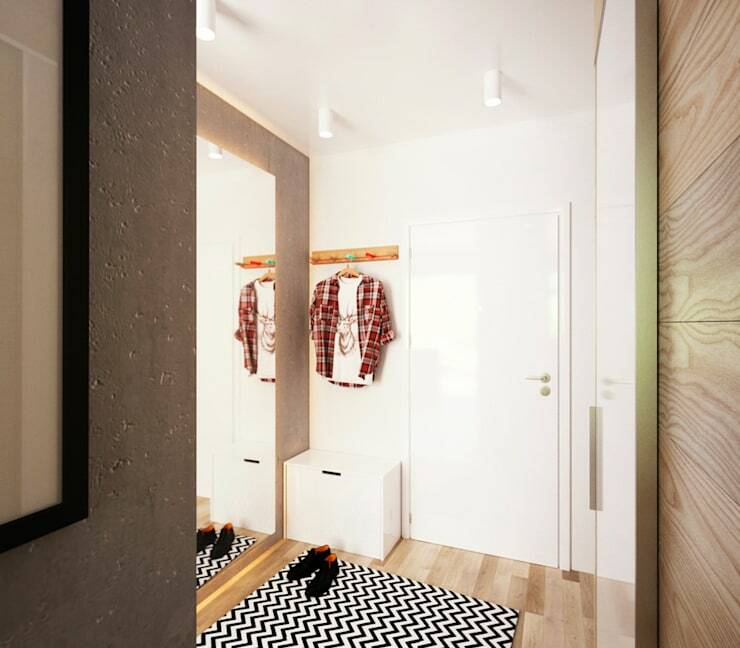 Find a space in the home that isn't being used, such as this hallway space that has been utilised by Kapran-D.E.SIGN. Note how comfortably the desk, shelves and chair fit into this space as well as how it doesn't feel cramped due to the art on the walls and the bookshelf above it. Make the most of a small, neutral desk but add a colourful chair or desk lamp. The walls around the desk should also be creative and inspire productivity. Use some beautiful art pieces or some bold picture frames. The colour of the walls around the home office is also very important. Use a tone that complements the furniture that has been chosen. Small spaces can be the most fun to decorate as often, it's when the most creativity is needed. Pull it off and there will be a stylish, design magazine worthy home on the other side. Have any of these ideas inspired you to improve your small hall design? Let us know in the comments, below.